South Korea’s Ministry of Unification confirmed Friday that its vice minister met with US Forces commander and head of the UN Command Vincent Brooks a day before the UNC rejected Seoul’s plans to test-run a cross-border railway. “On Aug. 22, Vice Unification Minister Chun Hae-sung met with Gen. Vincent Brooks to explain and ask for cooperation on various matters concerning inter-Korean ties such as the reunions of families separated by the Korean War while exchanging opinions on joint survey of cross-border railways,” the ministry’s deputy spokesperson Lee Eugene said during a regular press briefing. The announcement comes a day after the UNC and a Unification Ministry official told reporters that the UNC declined the request to allow South Korean officials and trains through the demilitarized zone, bisecting the two Koreas. The UNC oversees the cease-fire agreement that ended the 1950-53 Korean War and activities within the DMZ. 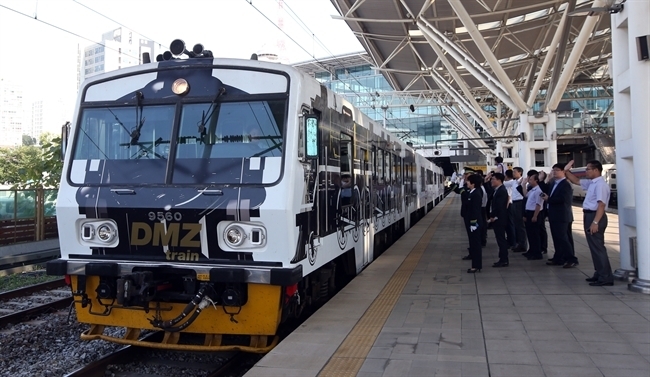 The request was for a weeklong test run of a six-car train from Seoul Station on Aug. 22 to the military demarcation line, which would switch to a North Korean train from the inter-Korean border to Shinuiju, situated near the North Korea-China border. The UNC sent a message to a group of reporters citing Seoul’s lack of “details for the proposed visit,” with sources saying that Seoul had failed to meet the guideline of providing notification 48 hours in advance. But critics have pointed out that the UNC has shown flexibility regarding the “48-hour” rule on previous occasions. The request was submitted on Aug. 21. Reiterating that that joint survey is not subject to sanctions against North Korea, Lee said that Seoul is currently negotiating with the US and the North on the matter, and plans to announce a new itinerary once all “preparations” are complete. However, when asked to address the view that the UNC was concerned about the fuel that were to be used in the test-runs, Lee evaded a direct answer and declined to confirm whether oil was included among the list of items they were planning to take to the North. Experts have interpreted the UNC’s decision as a warning from the US to the South to keep inter-Korean relations in tandem with progress in denuclearization talks. The two Koreas have been working toward expanding cross-border economic cooperation since the April summit between its two leaders, but the US has repeatedly said that the sanctions will remain intact until complete denuclearization is achieved.